Lexx splashed toward Skate, but the dice seemed quite up to the game and skimmed over the water just out of Lexx’s reach, teasing him by getting just close enough at points so that his hands would touch, but not be able to get a good hold. Chel held on and laughed at Lexx’s futile attempts, forgetting how angry she had been moments before. Back on the rock, oblivious to the play going on in the water, Zeta, Fly and Stealth were sprawled out in the sun. The rock was warm, the air was nice and best of all, their fur was no longer as soaked as it had been. They were just starting to doze in the light when the warmth was interrupted and they heard a soft humming sound,.. a familiar humming sound. Their eyes snapped open and they stared upward into the undercarriage of a passing space ship. It was a small, two-person ship, mostly used to go down to a planet’s surface from a much larger orbiting shuttle. This one had a sigil painted on the bottom of it in crimson against a black background. It was an identifying crest and unmistakable. 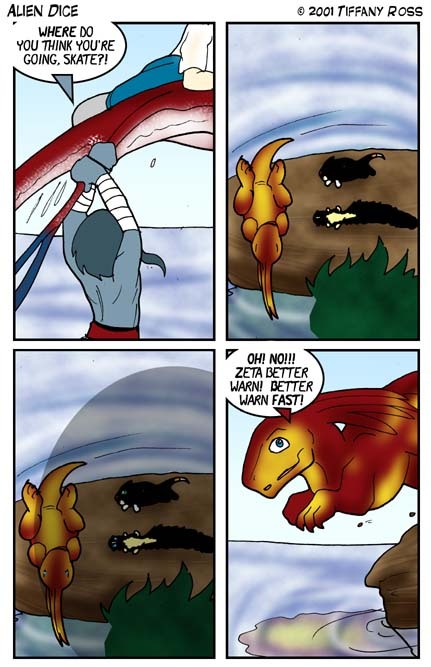 Zeta quickly rolled to his feet, crown back as the ship circled and landed on the beach. “Oh! No!!! Zeta better warn! Better warn fast!” The little dice leapt off the rock into the water without a second thought, despite his earlier protestations. Moments after he left, a reddish black creature burst from the foliage and raced down the beach barking, “Yerf! Yerf! Yerf!” Stealth arched her back and darted to the nearest palm tree with Fly right behind her. Instinct told them that anything moving that fast and made noise, necessitated a trip out of reach.